The global struggle for real democracy exposes the divorce of power and politics at the heart of the capitalist state. Autonomy is the only way forward. As the ongoing uprising in Turkey and the mass protests in Bosnia, Bulgaria and Brazil confirm, the wave of struggles that kicked off with the Arab revolutions of 2011 is still in full swing. However, it is also clear that, two years hence, the “dangerous dreams” of the Arab revolutionaries, Europe’s indignados and America’s occupiers largely remain unfulfilled. In Europe, the austerity mantra is still being uncritically praised and dutifully imposed by governments of the left and the right. In Egypt, Islamist forces have successfully managed to hijack the revolution by taking state power and suppressing its epochal promise of radical emancipation. In the United States, meanwhile, the bodies that once assembled on Wall Street seem to have dissipated back into their previous state of social atomization. In the present conjuncture, an old but important question arises — both for the movements that kicked off in 2011 and for the ones currently underway in Turkey, Brazil and elsewhere: what is to be done? According to some, including prominent leftist thinkers like Slavoj Žižek and Alain Badiou, the spontaneous and autonomous character of the new revolutions poses a number of risks. Most importantly, these critics argue, the lack of centralized leadership and the fetishism of horizontality that define these movements risk condemning them to an ephemeral existence with limited influence on concrete political outcomes. Without the necessary structuring leadership of what Badiou and Žižek call the Master – presumably in the form of a radical party – the protests are bound to resemble nothing more than flash mobs, marked by temporary explosions of carnivalesque contestation that ultimately do little to undermine the deeper power relations that constitute capitalist society. In the most cynical of these interpretations, the new revolutions could even end up reinforcing capitalism. Today’s Movements: Advancing Socialism Without the Politics? Today’s protestors do not affiliate themselves with parties or programs; they do not enter the political arena to obtain particular political goals, or even to actually alter the system entirely. The common refrain is that politics ‘are all hopeless anyway’. As such, today’s protesters want socialism in the abstract: ‘values’ and ‘ideals’ like equality, fairness and non-materialist modes of existence, but not any particular potentially feasible practice embodying these values. It is a critique that the Occupy movement is very familiar with, of course. First, the mainstream media and political establishment chastised the protesters for failing to articulate any clear demands; then the institutional left joined in, criticizing grassroots activists for refusing to organize themselves into a party and to aim for state power. It is a similar line of critique as the one that has been leveled at the autonomous Zapatista rebellion in Mexico, the spontaneous popular uprising in Argentina and the leaderless alter-globalization movement in Europe and the United States, all of which helped to animate the world’s most important anti-capitalist struggles around the turn of the century. In fact, it is a critique that goes back much further than this, extending from Marx’ thundering polemics against the anarchism of Proudhon and Bakunin to Lenin’s scathing critique of Rosa Luxemburg’s concept of revolutionary spontaneity; and from the Stalinist crackdown on the anarchist militias of revolutionary Catalonia to the contemporary Marxist critique of the events of May ’68. It is quite interesting to note, in this respect, that there is a long-standing and somewhat curious coalition between the theorists of the institutional left — represented in this case by radical thinkers like Slavoj Žižek — on the one hand; and the liberal political establishment in democratic capitalist society on the other. Both have consistently criticized the Real Democracy Movement for its refusal to respect the organizational exigencies of party politics; both argue that, to be taken seriously, the activists should cast aside their revolutionary illusions and accept the basic rules of the game. Without representation in parliament, they argue, no one will listen to them. If only the protesters would get their hands dirty and do some politics, these two strange bedfellows seem to agree, we can at least start a conversation. Something quite amazing is happening in Istanbul. In addition to the silent “standing man” actions around the country, people’s assemblies are slowly starting to emerge in different neighborhoods across the city. As in Spain, Greece and the Occupy encampments before, the protesters in Turkey are starting to counter-pose their own form of direct democracy to the sham of a democracy proposed by Erdogan’s authoritarian neoliberal state. If there was ever any doubt, this shows how deeply intertwined the global struggles truly are. The Yinka Dene Alliance has sent a cease and desist letter and is warning Enbridge against trespassing in their traditional territories as the company seeks temporary permits for drilling and tree removal for its unapproved Northern Gateway pipeline, a project that is opposed by the BC government and more than 60% of British Columbians. Have you heard the story about the Italian workers who took over the bankrupt company that previously employed them and started a new cooperative, all while doing something for the environment? This is the story of Ri-Maflow. In March2013, a group of some fifty workers in the town of Trezzanosul Naviglio nearMilan, decided to occupy the factory where they used to work and run it as a cooperative making and selling recycled electric and electronic components. These workers were previously employed by Maflow, an Italian multinational that made pipes for car air-conditioning systems. For many years, Maflow was a market leader servicing many big car companies; BMW was its biggest customer. But after a series of financial difficulties, the company closed down its main Italian arms at the end of 2012. The workers, however, refused to give in. A few days after they were made redundant, a group of former employees broke into the factory and started the machines again. We, the assembly born on the days of the December riot of 2008 – which you would so much like to forget – , broadcasting on 100.1 fm. In the 5 years of Radio Entasi, we saw the movement passing through many phases, we saw society resisting, instituting, and abandoning the traditional ways of politics. We saw the economic crisis evolving in a crisis of values of a system that can’t represent anybody no more, because there is nothing common anymore to be represented. Whole parts of society are being placed in a condition of exception: from the strikers in the Public Transportations to the villages in Skuries, Chalkidiki, people are being outlawed. Radio Entasi could not be an exemption. After all, we were present. Radio Entasi was there, on the riot of December 2008, on the occupied Syntagma square in 2011, and every time where the heart of the movement was beating, giving the frequency 100.1 fm to the voice of the oppressed. And while everybody knows that the radiowaves of Entasi are at the disposal of every fighting person, and while we respect our audience even in the KW that we are using, in contrast to the “legal” radio stations and the cell phone antennas, the Law ignores that. As it also ignores the true essence of the university as a public, free space for the communication of ideas . The Law wants to muzzle Radio Entasi. With an indictment and a lawsuit, the SKAI media company (which broadcasts “silence” from the Parnitha mountain, illegally on 100.6 fm, to “protect” the 100.3 frequency, whose shareholders promote the fascist Golden Dawn, openly or secretly), wants for us to shut up. Shut up? So that only the chandlers of solidarity, the grabbers of frequencies, the financiers of the new fascist battalions, the pimps of the environment and the forgers of information could speak on the fm? They are deluded. Radio Entasi will not be silenced! We continue to broadcast radically on 100.1 fm, interfering in the dominant frequencies. The sleeping giant is waking up. Brazil is awakening from the Fake Progress Dream of the 1%. Brazilians are taking the streets, but the media only talks about macro politics. Brazilian youth-and-not-so are demanding other economic, civic and social ways. But the media hides the facts: political assemblies in public, occupations of municipal assemblies (as Belo Horizontes´s occupation), new networked collectives fighting for the right to the city, for political participation… Media are showing empty reality shows, just as Turkish TV showed penguin documentaries when #OccupyGezi was coming to life. Istanbul and São Paulo are the twin faces of the Global Spring, a remix of the same shout. The same Brazilian tear gas is being used in Istanbul’s Taksim Square and Avenida Paulista in São Paulo. It is the gas of neoliberalism. “It is you who is not being mature, because you don’t understand the new logic of activism, self-organization, intelligence and collective outrage”. A nice detail of this still growing, networked Brazilian revolution was the open letter that Movimento Passe Livre (the collective that made Brazil burst) sent to Dilma Rousseff, Brazilian president, after being invited to a meeting: “This invitation is a surprise. We hope this means that Government will change its position and that dialogue will extend to other causes”. Movimento Passe Livre stated that there were no leaders at all. They are the 99%. Power focuses on public transport fees. And Government tries to find any kind of leadership. But the Brazilian meme is being remixed in Twitter, Facebook, YouTube and social media. Just as with Istanbul´s protests, which quickly moved beyond Taksim’s Gezi park demands, the Brazilian protest is now beyond #PasseLivre (free pass). A better public transport – even a free transport petition – is still an important demand in cities like Florianopolis, Belo Horizonte, or Recife. But the desire is bigger. The Direitos Urbanos collective – based in Recife, an important city in the north east – is fighting for a better city, from transport to ecology. #EuMePrepresento (I represent myself) is working on a national demand for an open democracy. And the meme is mutating. First It was #OcupaCopa (#OccupyWorldCup), with crowds in several cities protesting the World Cup and economic speculation. It was #VemPraRua, a kind of “take the street”, spreading throughout the entire country. It is not just about transport fees (although it also is, yes). It’s the economy, stupid. It’s Global Spring, stupid. It is #Vdevinagre, a mock tag that denounces the fines given by police to protesters using vinegar to protect themselves against tear gas. It is a remixed images flow feedingthe revolt. It is not about a 20-cent fee increase. It is for rights (a lot of collective and groups were formed around this idea). It is #OcupaCabral, a new agora for those who are surrounding Rio de Janeiro´s House during last days. It is #BRnasRuas, a much-needed shout for recovering public space and democracy. It is #OcupaGlobo, a rage against mass media manipulation. From Arab Spring to Occupy Wall Street. From 15M-Indignados to #OccupyGezi. From #YoSoy132 in México to #VemPraRua. It is the same global noise. But mass media iisn’t paying attention to this huge emotional network, to this upcoming meme war. Brazilian indigenous people in the Amazon region have blocked one of the country's most important railways in a protest for better public services. The railway is owned by mining giant Vale and connects the world's largest iron ore mine, Carajas, to a port on the northern coast near Sao Luis. The track transports more than 100m tonnes of the mineral each year. It is the second time this week that the trains have been halted by protesters of neighbouring villages. Protesters from several tribes burned wood on the railway in the Amazonian region of Alto Alegre do Pindare, demanding better transport, education, health and security. Last week, they blocked the railway for two days. Will offer access to low cost, transparent, high quality financial services to everyone. Will actively and directly encourage the development of innovative financial services that will foster financial inclusion, and lead the field in terms of openness and fairness. Will lead by example to affect a positive change for our members and stakeholders, and provide an uplifted standard of conduct for the financial community. Will actively work with business partners and organizations that demonstrate a commitment to the well-being of their communities. Access to financial services is an important public service. It should belong to the public. Your support will help launch the coop and its first product, the Occupy Card. The Occupy Money Cooperative will be owned and controlled by its members. Its members will consist of its customers. If you use its products, you will automatically become a member of the cooperative, with a voice in how the coop will be run, and what services it will develop. During the eviction attempt, community members drove sheriffs into the backyard, where they retreated after boarding up the property. 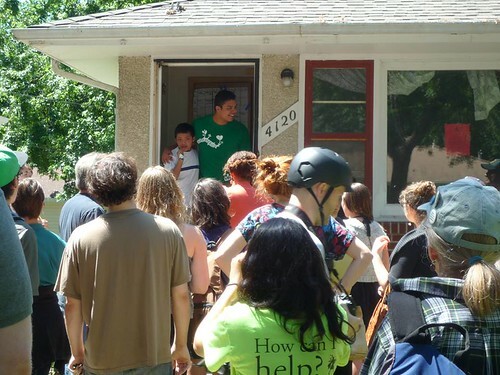 The Ceballos family, friends, and neighbors removed the boards and returned into the home. JPMorgan Chase Bank had told the Ceballos family that were considering them for a loan modification--but then filed for eviction at the same time. This process is known as dual tracking and is illegal under the national mortgage settlement. On Monday Chase asked for another loan modification application from the Ceballos family, which they accepted yesterday. "Yesterday we went to Chase because they said they would help us," said Jonathan Ceballos. 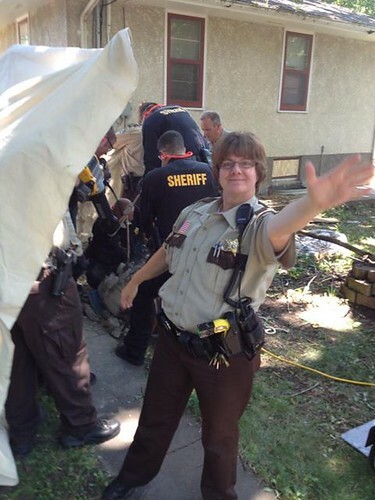 "Today the sheriffs show up at our house to evict. The question is, to the sheriffs and to Chase--who are you helping? They want to see another empty house but it's not going to happen, because we the people are here to support one another. We hope Mayor Rybak will not send police to attempt another eviction of my family while we continue to negotiate with the bank. We don't need any more arrests." More than 10 million people across the country have been evicted from their homes in the last six years. Her new book, "A Dream Foreclosed: Black America and the Fight for a Place to Call Home," focuses on four families who have pushed back against foreclosures. It was 10 years ago, on January 1, 2003, when — having exhausted the road of dialogue with the government as well the one of a “big R” Revolution that would overthrow the Mexican state — the Zapatistas of Chiapas decided to “abandon the politics of demands, and with it, all contact with the state.” Instead, they chose to concentrate on building their own autonomous, horizontal forms of self-government within their own territories and with their own means. The dialogue with the government didn’t work but it enriched us, because we met more people and it gave us more ideas. After the “Color of the Earth march” in 2001 we said that with or without a law we were going to build our government the way we wanted. The municipalities and communities in each zone are not only divided on the basis of geographical criteria but in other ways (like ethnic composition and distance from the caracol) as well. Each caracol has its own autonomous health clinic, normally a primary and/or secondary school, and each of them is also involved in one form or another with one of the five Projects of Zapatismo: health, education, agro-ecology, politics, and information technology. It was 10 years ago when the Zapatistas announced that they don’t need anyone’s permission to be autonomous, and started to work on what for them constitutes liberty and autonomy. And now, 10 years later, on August 8, 2013 the Zapatistas invite the world to a three-day fiesta to celebrate the ten years of Zapatista autonomy, in the five caracoles in Chiapas! For this Escuelita, around 1.500 activists from all over the world have been invited to visit Chiapas and study the Zapatistas’ experiment with autonomy through lived experience. The teachers will be the Zapatista communities themselves, which will host each and every student in their lands, one with every family, and let them experience what it is like to be member of the Zapatista Bases of Support; in other words, what it’s like to be a Zapatista. 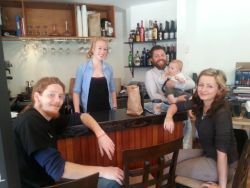 Bryan Dubien (far right) and staff pose at The Gathering, the first establishment to pay partial staff wages in Salt Spring Dollars. Uncivilisation 2013 is a gathering of people searching for answers to questions about our collective future in a rapidly-changing and depleting world. For one long weekend in August, the woods and chalk downland of the Sustainability Centre in Hampshire will be home to a festival of literature, music, art and action. It will be a place of encounters and conversations, learning and sharing, stories, ideas, music and performance. There will be campfires, wanderings in the woods, children’s activities, and workshops in everything from writing to scything. New stories are needed for darker, more uncertain times. Older ones need to be rediscovered. The Dark Mountain Project was created to help this happen. Members of Tahltan First Nations have taken a stand against a proposed coal mining project by Fortune Minerals on Mount Klappan. They've told company representatives to leave their traditional lands. Although the Tahltan aren't expecting that to happen by the 24-hour-deadline they gave the company yesterday, they say they aren't backing down. Members of the First Nation were hunting near the site where Fortune Minerals currently has set up a small camp. The hunters say the helicopter was scaring away animals for the food hunt, and that's when the Tahltan decided that they finally had enough. If the Arctos Anthracite mine project that Fortune Minerals is plannning goes through, protesters say it will be built on traditional lands that include Tahltan burial grounds. So they marched to the camp and told Fortune Minerals to leave the area. The Talhtan Band council has unanimously agreed that they want Mount Klappan to become a permanently protected area. The 1700 students who travelled from across Mexico and the world to attend the Zapatistas’ first school last week are leaving with an important homework assignment: to transfer what they learned to their respective collectives and movements. Thx epaulo. I needed an uplifting story. As the media stopped paying attention, many forgot about the Zapatista revolt. But quietly, away from the spotlight, they have deepened their autonomy. At his six-year-old height, Carlos Manuel hugs his father’s waist as if he’ll never let go. He looks up at the ceiling and smiles. Julián, his father, tries to escape. The child gives up, but stays close to his dad. Irma, his eight year-old sister, observes from the kitchen corner where their mother, Esther, is working over a wood stove, flipping the corn tortillas that are still the staple food of rural families. The three other children, including the oldest, 16 year-old Francisco, observe the scene that is repeated like a ritual at every meal. As governments in economic difficulties increasingly turn to environmentally damaging extraction industries for quick cash citizens of those countries are responding with increasingly louder cries of protest. The majority of Romanians see the mining project as a form of foreign exploitation and fear the environmental consequences, which could be horrendous. Local farmer Eugen David is leading the fight to stop the Rosia Montana gold mine, the largest protest movement seen in Romania since 1989. President Traian Basescu advised David and other opponents of the mine to sell their homes and leave town.What is it with Canadian corporations and the destruction of natural ecosystems? It seems, not content with devastating an area of boreal forest the size of the UK to extract the dirtiest of oil beneath – the infamous tar sands of Alberta – another Canadian mining corporation, Gabriel Resources Ltd., is set to flatten four peaks of the Apuseni mountain range in Romania, the town of Rosia Montana and adjacent villages and leave in its wake a massive lake of toxic tailings including deadly cyanide. All this plunder for a bit of gold – something that will merely fan the dying embers of an utterly corrupt and unsustainable economic system. However, there are rays of light – glimmers of hope – in this shadowland. 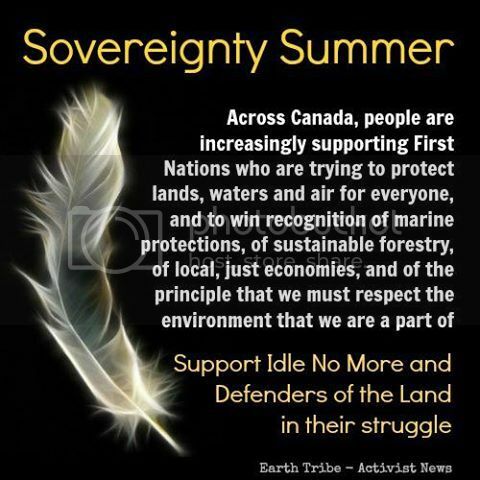 There are people all over the world who haven’t forgotten the wisdom of their ancestors and who are coming together in the name of ‘participatory democracy’ to ensure that their voice is heard; that they are not silent witnesses to the crime of ecocide. The protests are peaceful, people it on the sidewalk or on the street, march peaceful but don’t start conflicts. They are mainly young people but not only. After the march on the 8th of september the prime minister announced that they would stop the procedure. Still, the Parliament has to vote. The televisions started broadcasting some news about Rosia Montana project. One of the towns that initiated the social strife was El Catatumbo, in Tibu, north of Santander in the northwest of Colombia, where local farmers resisted 51 days in street battles like this one in the video. El Catatumbo's fight inspired thousand of other farmers who "lost their fear", and about a month after that, they started a nationwide farmers strike, a strike that 21 days after it began, managed to force the government to suspend law 970 and at least study their other proposals. To push a resumption of negotiations, the strikers opened the roads they had blockaded. The negotiations are ongoing, and they have to decide over more structural issues. ..i trust that my posts will reappear at some point so will carry on as if. This week has seen a phenomenal refusal (again) of people in Rio de Janeiro, Brazil to be intimidated off of the streets of Rio despite masses of police violence. As, more or less (*), the last continuing street protests and occupations from the earlier wave this summer across Brazil, three key factors have come together to bring an amazing and dynamic energy to keeping going despite beatings, arrests, injuries and so on. The thriving Spanish town of Marinaleda runs on the principles of mutual aid and direct action. In a country paralyzed by debt, is this an alternative? When money hasn’t been readily available — probably the only consistent feature since the community set out on this path — Marinaleños have turned to one another to do what needs doing. At times that has meant collectively occupying land owned by the Andalusian aristocracy and putting it to work for the town, at others it has simply meant sharing the burden of litter collection. “The best thing they have here in Marinaleda, and you can’t find this in other places, is the [general] assembly,” says long-term civil servant for the Marinaleda council, Manuel Gutierrez Daneri. He continues: “Assembly is a place for people to discuss problems and to find the solutions,” pointing out that even minor crimes are collectively addressed via the assembly, as the town has no police or judicial system since the last local cop retired. This thread deserves more attention and discussion. So far, I've just been a spectator. If anyone has relevant stories from closer to home, please post. I cannot see any alternative to the destruction of our species and a disaster for the planet, unless we are prepared to embrace some form of autonomy at every level, federated to the planet as a whole...exactly how, must become the discussion somewhere! I`ve dedicated my life to supporting autonomy movements and will be happy to post here! In a new report (pdf) focused on Scotland but with global implications, a coalition of social justice groups in the U.K. outlines the risks inherent to an economic system built to serve mega banks, and advocates for the radical reform of replacing these multinational conglomerates with small, local, and not-for-profit "people's banks" that would serve citizens instead of shareholders. Progressives have long argued that corporate banking is an enormous threat to the global economy, as the 2008 economic crisis clearly demonstrated. What's more, the situation has only grown worse as multinational mega banks continue to merge and consolidate—a trend that shows no signs of stopping. This latest call for local, publicly-owned "people's banks" joins a growing movement that has argued for such democratic reforms to banks in the U.S., Europe and around the world. The report, called "Banking for the Common Good: Laying the foundations of safe, sustainable, stakeholder banking in Scotland," was the result of a collaboration between the social and economic justice groups New Economics Foundation, Friends of the Earth Scotland, Move Your Money and Common Weal. I'm not saying this to cheerlead for centralization or anything, but I think an argument could be made that the autonomy of the United States (and I'm talking now about those individual States) might just be the most detrimental thing to any kind of progressive laws or initiatives down there. Is it a good thing, or a bad thing, if the autonomy of each State allows them, for example, to overturn a federal firearm restriction? As a prerequisite, the right wing libertarian gun enthusiastic would have to be supressed, followed in short order out of necessity no doubt by the liberty and free speech folks, not to mention the religious right in tandem with the usual assortment of baldfaced opportunitists typi8cally attracted to politics. This is my own sense, but I think 'autonomy' is an entirely different conversation than that. The Movistar Strike Committee - who call their strike The Revolt of the Ladders for their distinctive use of ladders in their demonstrations - rejected the unions’ negotiated peace and declared an ‘indefinite strike’ which has now lasted for over forty-eight days. They have said that they will continue to strike until their basic conditions for an agreement have been met, and those include an 8-hour day, forty-hour week, employer payment of working gear and protection, and for a dignified ‘social’ salary which can support their families together with four weeks holidays to enjoy time away from work. From the unions the strikers demand their own seat at the bargaining table – a representative of the strike committee – in place of an external representative sent from the dominant unions, in whom, they made abundantly clear, they have very little trust. When strikers are having to negotiate with both the company and the union, you know something has gone awry. It was only last night, the second night of their occupation, when Barcelona elected as mayor an anti-austerity and anti-eviction candidate from a coalition of community activists who have promised to give unwavering support to the strikers. All of a sudden then, the Movistar-Telefonica strikers have friends in high places. Whether they win or they lose, and whether they can arrive at a compromise or not, what is clear is that this event is indicative of something larger going on in the population – and that is the collapse in faith in the trustworthiness, representativeness and utility of the country’s two main trade union confederations. Words of cynicism and distrust are repeatedly heard by activists of the country’s countless social movements, whether it is the excluded and isolated Movistar-Telefonica strikers, the powerful and popular PAH platform of indebted mortgage holders and evictees, or whether it is just ordinary people who see the union movement as but one more player in capital-P politics, even to the extent that they form part of the hated casta, the ruling class. Yup young people can do things. In my Grade 12 year myself and others organized a city wide walk out of high school students in seventeen schools. I am pleased to see that kind of '60's Yippie movement making a comeback. I'm curious how this rally turned out. Anyone here know? This weekend, federal Liberals from across B.C. will descend on Victoria to attend their biennial policy conference and convention. And, at 12:30 p.m. on Saturday [12 Feb 2016], concerned citizens will descend on the Liberal convention to tell them to repeal Bill C-51, the so-called Anti-Terrorism Act, 2015. The public bank would open on July 1, 2017 by transferring $100 million of public funds, presently in a multinational bank, into Santa Fe’s own Public Bank. The bank’s first act of business would be to refinance $45.5 million of the city’s loan and bond debt at 4 percent. This is a low-risk way to get a bank up and running, and it would benefit the public as a whole. Most newly chartered banks expect to operate in the red for their first three years, but not our Santa Fe Public Bank. It sounds counterintuitive, but the fact that the city has ample deposits and a lot of debt makes it possible to put a public bank on solid financial ground in the first year. In year one, the bank would make a modest profit of $500,000, and, by year five, the bank will have increased its lending to $90 million and made a profit of $10.5 million. Profits will continue to grow as more debt is refinanced and new lending happens in the community. This is a source of revenue that will not need to come from a tax increase! The public bank also will save the city $1 million in year one and reduce the city’s total debt for that portfolio by almost $5 million (9 percent) over five years. Annual payments also would be reduced, giving the city a little breathing room. Also in the first year, the bank would work with local banks and credit unions to invest an additional $5 million to start growing community resources such as affordable housing, renewable energy or entrepreneurial startups. We anticipate that, as the bank grows in experience, this kind of participation with local banks will increase substantially. They built self reliance in their numerous collective farms and the original Camel´s Foot Commune, natural agriculture and alternative energy projects, but their focus was to build self reliant intensive cooperative community, building an impressive community culture, festivals, art and culture. 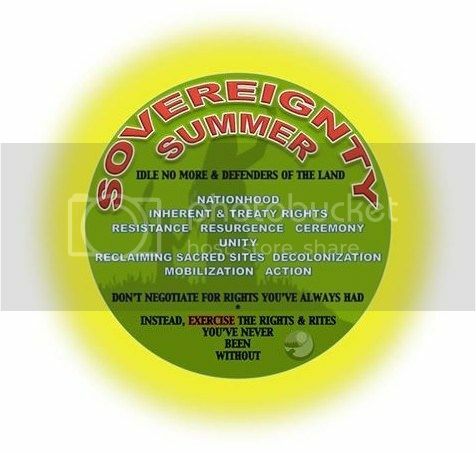 They built their ideas of self reliance and bioregionalism in defence of their designated territory, built close relations with the Bonaparte Secwepemc and successfully shut down a BC Hydro coal methane project on Shuswap peoples unceeded Territory, while continually fighting the logging interests locally. This is the 4th and final post in a series on childhood trauma. In the 1st post, I expose my personal reasons for being an example in this struggle to create Compassionate Schools. In the 2nd post, I tell the stories of how children who have walked through my classroom doors have been impacted by trauma. The 3rd post discusses new pathways to creating cultural changes within our schools. Here, in this last post, I connect the dots of EduActivists’ work to other movements through Paulo Freire’s Pedagogy of the Oppressed and collaborative activist work I engaged in this summer. Here I make the point that in order to have Compassionate Schools, we also need a compassionate society. The Borborema Pole is a forum of rural workers’ unions and family farming organisations covering 14 municipalities and more than 5000 families in the semi-arid Borborema region. From the early 2000s onwards, the Borborema Pole and AS-PTA, an NGO active in the region that is also a part of the AgriCultures Network, began to devise collective, local development plans based on strengthening family farming and the promotion of agroecology. Methodological principles of building on local knowledge and collective learning among farmers lie at the heart of our work. Through these principles we have supported family farmers in developing numerous agroecological innovations to overcome technical, economic and socio-organisational barriers over the past 15 years. Despite successes, however, a patriarchal culture remained dominant both within the family and in organisations in the region. This made women’s knowledge, their practices, and their importance for the farm household invisible. Their capacities were not fully being put to use. The inequality between men and women was a barrier to the full implementation of agroecology across the region. ..it took me a while to work out my approach to first nations autonomy in this thread. most of the incredible struggles i’ve posted around extraction involve the expressions of that autonomy and so did not want to repeat what was already there. so i post this video which i find very informative and lies at the heart of all our struggles here in canada. it is very sad and shameful that all mainstream political parties have in the past and continue today to be purposely involved in maintaining colonialism. the video as an hour long and i hope folks will take the time to watch, learn and understand. 150 Years of Canadian Colonization and our Right to Self-Determination with Arthur Manuel. Arthur Manuel is a Secwepemc-Ktunaca activist. He discusses colonization in Canada and how this systemically impoverished Indigenous Peoples for generations. If Canada is going to renew its relationship with Indigenous Peoples it must recognize the colonial relationship it has with Indigenous Peoples. 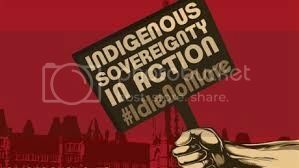 Canada must recognize that this colonial relationship gives Indigenous Peoples the right to self-determination. This will become clearer when Canada celebrates 150 years of its settler colonial relationship with Britain in 2017. ‘Kurds in Northern Syria are expected to declare a federal system in Syria, with the areas they have seized in the northern part of the country acting as an autonomous zone. The announcement is expected to come in a matter of hours according to media sources on the ground in the Kurdish-controlled areas. According to these reports, a conference to declare the federation of three Kurdish entities in Syria will take place in Rmelan. This changed when women started to organise themselves in local producer organisations. One of these is the Association of Strawberry Producers of Namaacha (APMONA), consisting mostly of widows and their families. When a man dies he leaves behind a great responsibility to his wife to take care of the family, feed the kids, keep the house, send children to school and produce food on the land. The widows of the Association are farming as their main (and in many cases only) economic activity to support the family. They resolved to grow their food in a way that is consistent with agroecological principles. Their production is based on a model that divides the land into individual and community plots. From the community plot, a portion of the produce goes to each member and her family, and the rest is channelled to the local market in Namaacha. The benefit of having a collective machamaba (field) is that peasants share knowledge with each other – it’s a space for learning. This article was written in 2010, but it is completely relevant today and it provides an excellent history and description of the Solidarity Economy. By Ethan Miller and published in Kawano, Emily and Tom Masterson and Jonathan Teller-Ellsberg (eds). Solidarity Economy I: Building Alternatives for People and Planet. Amherst, MA: Center for Popular Economics. 2010. People across the United States and throughout the world are experiencing the devastating effects of an economy that places the profit of a few above the well being of everyone else. The political and business leaders who benefit from this arrangement consistently proclaim that there are no real alternatives, yet citizens and grassroots organizations around the world are boldly demonstrating otherwise. A compelling array of grassroots economic initiatives already exist, often hidden or marginalized, in the “nooks and crannies” of the dominant economy: worker, consumer and producer cooperatives; fair trade initiatives; intentional communities; alternative currencies; community-run social centers and resource libraries; community development credit unions; community gardens; open source free software initiatives; community supported agriculture (CSA) programs; community land trusts and more. Everything has a price. Everyone can be bought. We assume this principle is endemic to modern life — and that accepting it is most obvious to the impoverished. Except all over the world, people are defying it for a greater cause. That courage may be even more contagious. It has been in full supply in north-west Canada, where an oil giant is aiming to construct one of the country’s biggest fossil fuel developments: a pipeline to ship liquified natural gas (LNG) out of British Colombia. To export it overseas via tankers, Malaysian-owned Petronas must first win approval for a multi-billion dollar terminal on the coast. On the other side, the salmon protectors, feeding tens of thousands and supporting a commercial and recreational economy crucial to British Columbians. Promoting an abundance of life instead of threatening to extinguish it. Taking care with the land so that it can take care of people. Getting by on what the earth can continually restore rather than depleting forever what lies beneath. This is an Indigenous outlook, but one ever more people share. It is in sync with the knowledge that our energy sources must work not against natural cycles but with them — harnessing the power of the sun, water and wind. This can provide jobs in far greater numbers than fossil fuels. And this is the kind of economy we need more of: regenerating naturally, creating enduring local benefits, existing in balance with the natural world. It is, in other words, everything a dirty energy economy is not. The most dangerous imbalance of all that would be generated by this industrial project, Yahaan says, has only deepened the community’s opposition: its contribution to climate change. Far from clean, emissions from an LNG industry would shatter the provincial government’s emission targets. The Petronas plant and its associated fracking alone could become the country’s largest carbon polluter. ...my attempts in various threads to promote a movement based political strategy clearly has fallen on deaf ears...perhaps the experiences in Greece re Syriza and further analyses and need to build a movement for autonomy may be clearer...I consider this an essential reading and with the fundamental idea to build a movement of social organization AND alternative economics from the base community! ..i still don't know what your atonomy looks like iyraste. as i have shown by my posts, autonomy already exists and that is what needs to be built upon. autonomy is rooted in peoples and their struggles. show me what your autonomy looks like please. show me your people. March, 2016 to February, 2017 As you may already know, the Next System Teach-Ins are kicking-off this Thursday – with our inaugural teach-in beginning today in Madison, Wisconsin! We are thrilled that so many have responded with enthusiasm to our call for nationwide teach-ins on systemic change and transformation. We’ve heard from folks from across the country and around the world — from small-town Alabama to Detroit, from Ivy League universities to community colleges and adult education centers, and from retirement communities to faith-based organizations – expressing their interest to first discussing and then beginning to move towards a next system. Join us for a weekend of community collaboration, cultural expression, engaging discussions and workshops with local leaders. On Thursday evening, we will be opening with a panel of student leaders who work on racial, environmental, and labor justice. During lunch on Friday, we are excited to have author, political economist, and activist Gar Alperovitz join us as our keynote speaker. Because the teach-in belongs to us all, Friday’s breakout workshops are sessions that local leaders, community organizers, students, and faculty have proposed and range in topic from community control of the police to equity in healthcare to fighting fossil fuels and climate change to participatory banking; these sessions address large-scale system change as well as localized solutions. On Saturday we will wrap up our conversation by determining concrete next steps that we can take to create a more just and equitable system for us here in Madison.